I want to start a new Monday tradition for a while–quotable Mondays. Share your thoughts on the quote either here in the comments or on your own blog and link up in the comments. Isn’t this so true? Children have such a unique way of looking at the world. Perhaps it isn’t unique. We all did it. But somewhere along the way of growing up, most of us forget to look at the world that way and start to take ourselves far too seriously. This is one reason I love, love, love toddlers. I love the way a toddler is fascinated by everything she sees. No leaf is too ordinary. Everything deserves our attention and study. My toddlers have taught me to take pleasure in the simple things and to stop and smell the roses. Toddlers also have a love for everyone. They do not judge by appearance. I love babies because they force us to slow down. We learn to enjoy the simple things in life and to enjoy just being home with our families. We learn the power of a simple smile and the profound meaning behind the word “goo.” We learn to serve and love unconditionally. My preschoolers make me laugh. There is always a funny phrase coming out of their mouths. They also teach me about the importance of honesty. True honesty, but honesty that is enveloped in love. My children have taught me the great satisfaction in learning new things. There is joy in learning, and we are never too old to learn something new. None of us is ever done learning things in life. And if we put the same amount of effort and concentration into learning as the children do, there is no stopping us! 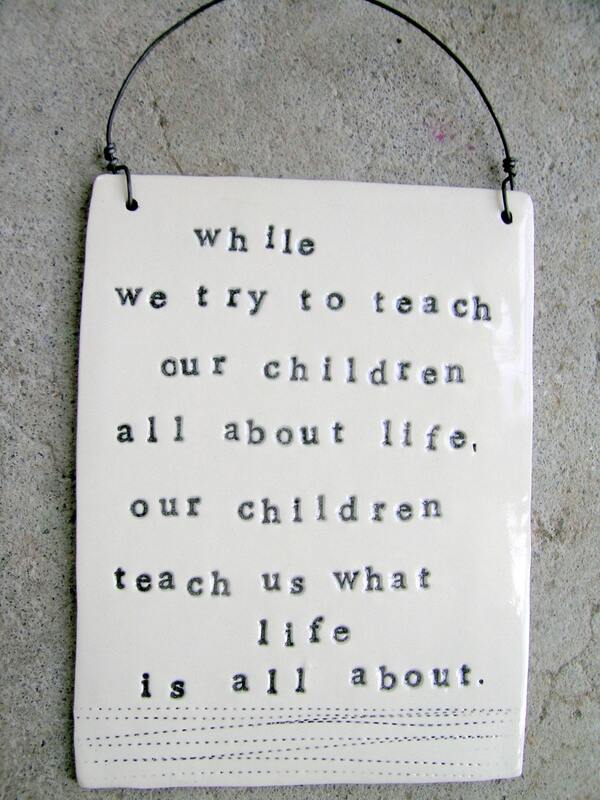 So what have you learned from your children? I LOVE quotes, and actually keep a journal of sorts noting every delicious quote I come across. Can't wait for this series to continue on Monday's.I've just started blogging, so I only have one post that contains much in the way of quotes: http://optimisticmusings.wordpress.com/2012/10/29/one-thousand-gifts/Here are a few more that I LOVE by the same author (Ann Voskamp):"There are a thousand ways to be stretched thin and it’s the stretchmarks that a woman wears that can be her thin places, giving her more of God. ""A mother fills, only to empty, and empty, and empty, which fills her full again, and isn’t this giving away the way to have it all? ""Grace is the backbone of every woman still standing." That's some great blogging! Thanks for sharing.